Nick Vujicic, who has packed stadiums around the world with his positive message on life and approach to overcoming adversity, told RT we all have “disabilities of fear,” and you should never give up, otherwise you won’t grasp your real limits. “My message is universal, especially for ‘able-bodied’ people: we have disabilities of the heart, we have disabilities of fear and we need courage to overcome adversity and love one another,”Vujicic told RT’s Oksana Boykoin an interviewon Sunday. Vujicic says his expectation of life is “joy beyond circumstances,” as it doesn’t matter whether you have a job or education. “First of all you have to know the value of you as a person, as an individual. You are irreplaceable,” says Nick who was born with tetra-amelia syndrome, a rare condition characterized by the absence of all four limbs. The author of the book “Life Without Limits” says he believes in miracles and is waiting for them. “I actually keep a pair of shoes in my closet in case God gives me arms and legs miraculously,” said Vujicic, repeating a famous phrase of his. “I’m content. My treasure is not here. My treasure is in my faith and my family,” says the husband and father. He has a two-year-old son. Nick told RT’s Worlds Apart program that he himself is his worst enemy “because I let the lies grow in my mind” such as the “lie” that he is not good enough, that he is not going to get a job, get married, touch his wife’s hand, or hold his kids when they are crying. The 32-year-old alluded to bullying he experienced at school. He even attempted suicide at the age of 10 after he was once badly bullied. 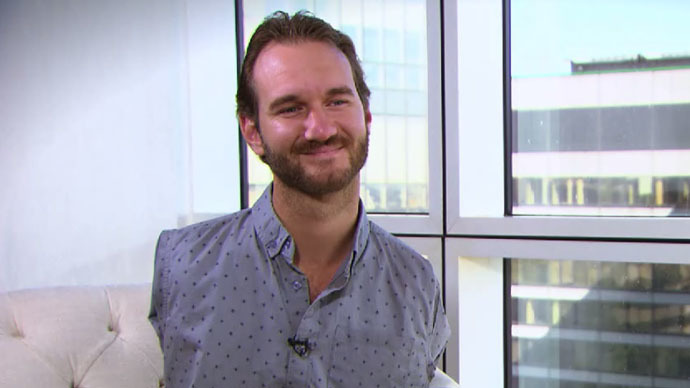 Vujicic, who has a Bachelor of Commerce from Griffith University in southeastern Queensland, has spoken inspiringly in stadiums and other venues across the globe. He has addressed over five million people in almost 60 countries on five continents.